John Lenotte is the recipient of the 2012 Valley Patriot Hero of the Year Award and is Commander of the Wilbur M. Comeau Post 4, Haverhill, MA; Past Department Commander, of Massachusetts The American Legion; contact: JohnLDistrict8@verizon.net. 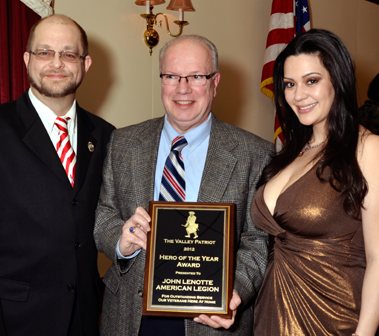 Pictured with Lenotte (middle), are Valley Patriot publisher Tom Duggan and Award Presenter Anabel Gutierrez. Memorial Day is again approaching. That time for the unofficial beginning of Summer. And after this last Winter, we are all looking forward to sun and warm weather. As I do every year, I will ask you to take a few minutes to think about those who made sacrifices so we call all enjoy the many freedoms we have as Americans. This year it seems that more and more of our World War II and Korean War veterans are passing away. Vietnam War veterans are also getting older and moving on to what we call “post everlasting”. For a period of time I have been attending an average of one wake per week! It reminds me of how fragile life is and how really short life can be, given the total expanse of time. Most of these men and women have given so much, yet asked for so little in return. Unfortunately, we still see many having problems getting appointments and timely care from the Veterans Administration (VA). The American Legion and other organizations are asking Congress to give the VA full funding for the coming fiscal year. Those veterans going to the VA are in need of care today, not tomorrow when it might be too late. We have a younger generation of veterans who are also in need of care, many who are still in the military but will need help when they transition to the civilian world. How can young men and women, our children and grandchildren, be asked to serve in the future with little guarantee that any problems from serving will be taken care of by our government. The need for veterans is not only for medical issues. Credentialing is still an issue. If someone served as a combat medic, there should be an easy path to become an EMT; or if they were a truck driver, it should be a little easier to get a CDL license. Credit for military training and experience should be considered. On April 28, 2015, The American Legion conducted a credentialing summit. According to the press release: Highlights of the summit included several interactive panels that cultivated discussion between attendees and private sector, nonprofits, military and federal agencies, and other organizations. Guest speakers included Secretary of Labor Tom Perez; Teamsters President James P. Hoffa; Maj. Gen. Rex Spitler, Deputy Chief of Staff for the U.S. Army’s Training and Doctrine Command; and Maj. Gen. Tim Orr, Adjutant General of the Iowa National Guard. They addressed critical credentialing issues and provided details regarding programs certain services have in place to prepare departing service members for life after the military. The day’s topics also included assessing the quality and value of credentials, closing the skills gap, military spouse credentialing and credentialing best practices in transportation. These issues have gotten some attention but need more work. Please, please join me in reaching out to our Congressional delegation and make your/our voice heard in these matters. And this Memorial Day, remember that, “All gave some, but some gave all”. May God bless our troops and their families.